Thermal radiation (or infrared) is a band of energy in the complete electromagnetic spectrum and it has been used effectively for millennia to treat/ease certain maladies and discomforts. FIR (far-infrared radiant) wavelength is too long to be perceived by the eyes, however, the body experiences its energy as a gentle radiant heat which can penetrate up to 1.5 inches (almost 4 cm) beneath the skin. 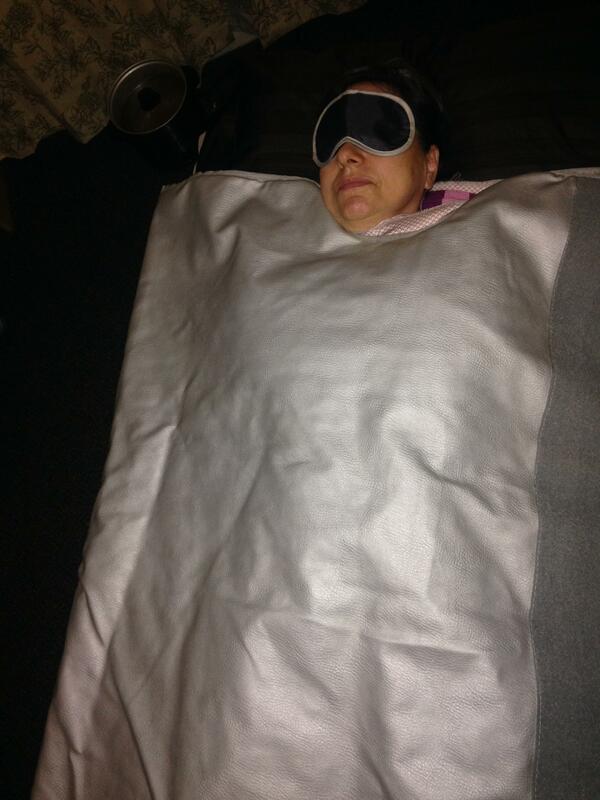 Oasis Therapy uses a sauna blanket delivering a three zone heating differential, offering many benefits. *For best results, 2-3 treatments per week is recommended. Dissolve fat: FIR rays makes a direct action to the fat structure in effort to dissolve and liquefy the fact cells. Eliminate fat: FIR can release a great deal of heat energy, accelerate the circulation of blood and lymph, promote the metabolism, speed biochemistry reaction for proper cell function to break down fat. Shrink fat: FIR rays increases temperature to the local tissue, which enlarges pore to outflow sweat, which shrinks cells. Lymph detoxification: Heat enlarges capillary vessels, speeds blood circulation-increases metabolism. This encourages fat to dissolve and enter into the blood, which accelerates lymph circulation to excrete from body. Relax muscles: Heat generated by FIR not only warms the body internally, down to the bone, but also promotes relaxation and lessens muscle tension. How does Far-Infrared therapy work toward healing the body? When buying directly from Oasis Therapy, your deal will NOT expire after purchase. Amount paid never expires. Appointment is required. We typically book out 1-week during the weekday and 2-weeks out on a Saturday. Please expect to leave your redemption code, this will hold your appointment. At the time of your call, an expired voucher is a credit of $49 (paid value), and will need an additional $49 (promotional value) on the day of your scheduled appointment. No-show, rescheduled, or a cancelled appointment with less than 24-hour notice may be subject to a fee of $25, at the time of your re-scheduled appointment. Be sure to read fine print on voucher for important information about Groupon offer details and/or restrictions. Periodically, Groupon lowers their price point in effort to attract more attention. Our price could be a few dollars extra but know, we are offering this deal with NO expiration date.